The event was the first in Iowa and in fact is one of only four such programs in the world. While Iowa’s RYLA, as reported in an earlier Our Grinnell article, focuses on high school students, YRYLA targets middle schoolers. Cuardado, right, a Colorado native, is well qualified to speak on behalf of the program. A RYLA participant in 2010, he referred to that event as a life-changing experience, and he took advantage of other Rotary youth programs. As a Rotary exchange student, he spent time in Italy. Today, having earned a degree from Princeton University, he is a PhD candidate in Italian literature at Columbia University in New York. 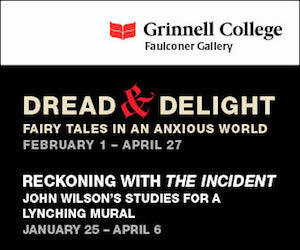 He hopes to teach at an institution like Grinnell College one day. Meanwhile, when the organizers of Iowa YRYLA 2017—Dave and Betsy Kutter—asked if he might be available to advise and assist, Cuardado was quick to respond. 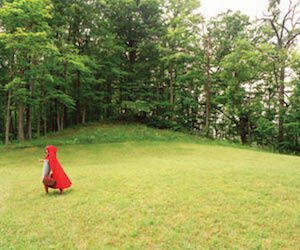 “When Betsy called, I came running,” he reported. His association with the Kutters goes back even further. 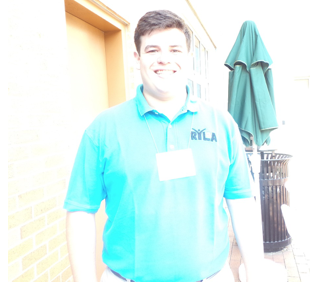 It was Cuardado’s father who first interested Dave Kutter in RYLA, and it was Dave who brought RYLA to Iowa seven years ago. “It’s kind of incestuous when you get right down to it,” joked Betsy Kutter. 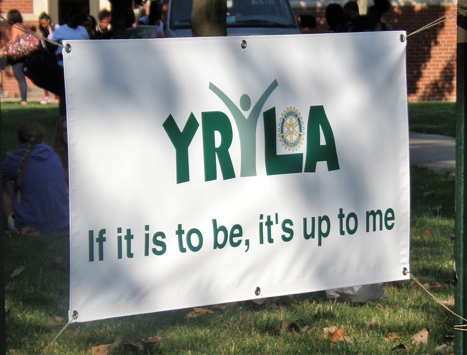 Iowa RYLA began with 37 students seven years ago, and YRYLA logged 32 initial registrants this year. 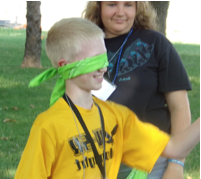 To develop leadership potential in students, organizers staged various activities such as the Trust Walk (left), in which a participant was blindfolded and forced to rely upon a peer to navigate within an area. Communication was limited; only touching was permitted. The exercise teaches the importance of nonverbal communication and the necessity of relying upon another person at times. Such an exercise also helps young people develop empathy for people with disabilities. Following each exercise, a debriefing session encouraged students to reflect, to draw conclusions, to relate the activity to their own lives. Motivational speakers form another core component of the YRYLA learning process. 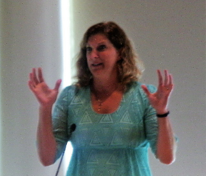 For example, University of Iowa volleyball standout Barb (Willis) Randall addressed students on Tuesday, July 25. Randall—voted Iowa’s Volleyball Player of the Decade for the 1990s, veteran of the United States National Team, 2017 inductee into the Hawkeye Hall of Fame—explained that her career as an athlete was slow in starting. Randall, right, grew up in Camanche, Iowa, a town of approximately 4,400 on the eastern edge of the state in Clinton county. Although devoted to athletics, her primary goal through her middle school years was to become a cheerleader—something that she did achieve early in high school—but an influential teacher persuaded her through a bit of tough love to turn in her pom-poms and head to the volleyball court instead. And at this point in the narrative, a standard comment would refer to the rest of the story being history, but such a comment would oversimplify. Randall’s volleyball career did become history, but only after hour and hours of work and practice and dedication. During her senior year, her team earned # 1 in the state. The University of Iowa proffered a walk-on opportunity in the form of an enticing full-ride scholarship, and Randall, who at the time did not know what “walk on” meant, accepted. Once a Hawkeye, Randall worked extensively with the help of coaches and invested more time perfecting her skills than NCAA rules would allow today. She traveled internationally as a member of the United States National Team from 1991-93, and she competed in the World University Games and the Pan American Games during that time. Displaying a quotation from Mahatma Gandhi, Randall stressed the idea that we cannot control how other people treat us or what they say about us, but we can control how we react. Her presentation also emphasized getting to know a person and not making judgments. Additional topics addressed through the week included personality types, youth exchange programs, friendship, bullying, and suicide. Rotary officials believe that leaders are not born—they are made. YRYLA works to focus on leadership skills but also—and perhaps more importantly—on the confidence required to apply those characteristics. Confidence—very much the key to success in middle school and beyond. Helping instill and shape that confidence is the worthy goal of the YRYLA program. 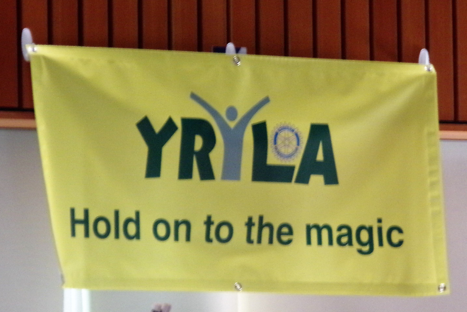 Anyone interested in RYLA or YRYLA can contact any Rotarian for information.